"We recently added HappyFeet to our center enrichment programming and it is a HUGE success. Our classes quickly filled up and the families are loving that their children are involved. 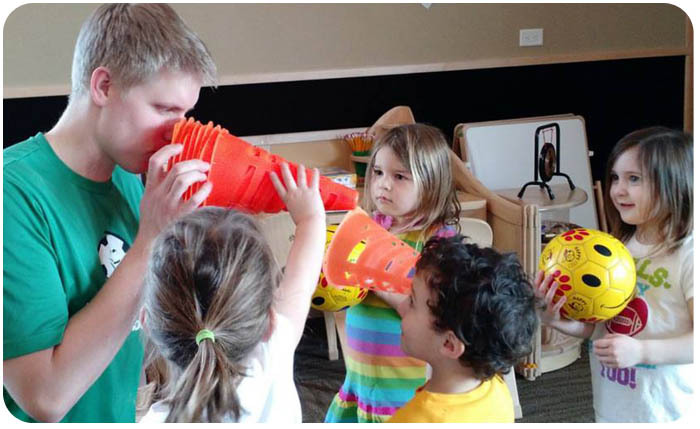 HappyFeet brings a fun, active, and developmentally appropriate program for the children to participate in. During the classes you can see Tim's passion for teaching the kids the game he loves. I am very pleased and happy with HappyFeet and would recommend their programming to any center." "My daughter takes soccer class from Twin Cities HappyFeet during her full-time preschool day, and of all the activities they do, she looks most forward to soccer! She has greatly improved her gross motor skills, along with foot-eye coordination. She remembers the various rules involved, and can't wait to give us the whole recap at the dinner table! Thanks for introducing our 4-yr-old to this fun and developmental game!!" "Our son Landen first discovered Happy Feet with Coach Tim at his pre-school. I've been very pleased with the soccer curriculum. I've been lucky enough to get to sit in on a few school classes to see what the kids learn and I was very impressed. Coach Tim teaches at their level and makes it FUN. Landen's favorite part is always giving Coach Tim a high five and making his hand hurt. When we learned about the Winter League opportunity, we were very excited but unfortunately, the drive was a bit far for us. Coach Tim went out of his way to accommodate our situation and lowered the league fee to make it more of an affordable option for us. Needless to say, we were very impressed and appreciative. League games were fun and although our son had a rocky start being he had to learn to actually SHARE the ball, Coach Tim and Coach Jess did an excellent job helping the kids to understand why and make it FUN. League games start with a warm up where each kid gets their own "Bob" (ball) and they play an assortment of team-building games. We really enjoyed watching Landen and his friends play in their adorable team outfits and shin guards. When the game commenced, Coach Tim and Coach Jess did an excellent job working with the kids as to keep the emotions at a minimum and also keep things safe by only allowing 3 players from each team to play at the same time and encouraging the kids to take water breaks as needed. I was happy that Coach Tim kept encouraging our son to come back in and play. Landen often wanted to just sit and watch because he can be quite the emotional kid but the way Coach Tim approached him, Landen always felt comfortable going back in the game and after just a few short weeks, we really noticed Landen's improvement. He improved not only in the skills he acquired but with his confidence. He learned to "attack" the ball instead of hanging out by the goal (as he did in the beginning). We were sad when Landen had to miss the last game due to illness and can't wait to join another league with Happy Feet. Thanks Coach Tim and Coach Jess! We couldn't have been more pleased with the experience." Isaiah loves his Monday morning soccer sessions. He has talked about Coach Tim and Coach Kyla on many ocassions and we can definitely see improvement in his soccer skils when we take him to the park for a family soccer game. Thank you Coaches. Our son looks forward to Fridays because its soccer day! He loves his coach Kyla and loves to show us his new skills each week. It's great to continue to keep him active and exposure to new athletic activities. Caden (2 yrs old) loves playing soccer with Happy Feet. Every time he sees a soccer ball he yells out "Bob!" Thanks for making soccer so much fun! My 2.5yr old son LOVES Happy Feet. Every ball he owns is becoming a soccer ball to him and I am amazed at some the things he starts to do with the ball! His balance and other gross motor skills are becoming much more refined and in a short period of time! His confidence level has seemed to go up as well. Thank you Happy Feet!!! Matthew really enjoys happy feet he looks forward to daycare every Thursday because he knows he has happy feet. Thank you so much! I Want HappyFeet at My School! New Horizon Academy Apple Valley-Cedar Avenue & McAndrews Rd. New Horizon Academy Eagan-Cliff Rd. New Horizon Academy Eden Prairie-Dell Rd. New Horizon Academy Plymouth 494 and Rockford Rd.